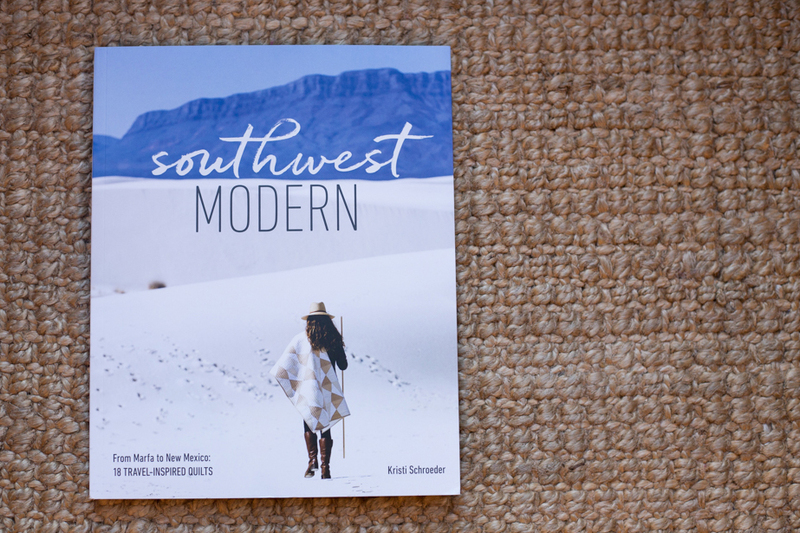 Today I'm happy to share a new book I recently received, Southwest Modern / From Marfa to New Mexico: 18 Travel-Inspired Quilts by Kristi Schroeder. Southwest Modern is a collection of 18 quilt patterns, along with a southwest travel guide. I love a beautiful book, andSouthwest Modern is absolutely stunning. As soon as I opened it, I wanted to not only get creating at my sewing machine, but also take a vacation out west! Within the quilt patterns, Kristi weaves stories of each location, how they inspired her, and her favorite places to shop, eat, and explore. Our family absolutely loves the National Parks, but we haven't visited any out west in the desert yet. I think it's time! And maybe make an inspired quilt as well! I also really love Kristi's color palette and use of solids in her quilts. They really allow her bold designs to shine and coordinate with the naturally beautiful landscape. Southwest Modern is 144 beautiful pages with 18 quilt patterns. Besides the stunning photography, there are over 70 detailed and easy to read pattern illustrations. I'm a visual sewer, so this really helps me! I hope you will take a moment to check out this gorgeous new book. I received a copy of Southwest Modern / From Marfa to New Mexico: 18 Travel-Inspired Quilts by Kristi Schroeder, courtesy of Lucky Spool Media. This post contains Amazon affiliate links.